Having a better brand than your competitors is much more important than having a superior product. If you pay close attention to your competitors’ branding strategies and know how to do a competitive analysis, you’ll be able to determine the steps necessary to outperform them with a strong brand presence. Regardless of your industry or company size, monitoring your competitors closely will give you a sense of their strategies. In particular, focus your resources on studying their online marketing efforts, as there are a number of great competitive analysis tools that can provide a lot of informative data for your company in a very brief time frame. What Data Should You Gather? Depending on the type of marketing strategies that are most important to your industry and the amount of resources you have available, you can identify who your competitors are targeting in order to inspire your own future expansions (though you’ll need to put that demographic information in context with your own branding goals first). Analyze and profile each of your competitors by defining their industry, their competitors, customers, and other key factors that differentiate them such as price, service, convenience, website performance and social media strength. To take this a step further, you could also conduct a focus group to gauge how customers view your brand relative to competitors. However, you should not limit yourself to traditional methods. Fortunately, there are online tools available to help. The intelligence-gathering tasks that used to take months can now be executed in just a few hours by using many online tools, including some of the ones described below. These and other tools can provide a comprehensive overview of your competition’s strategies. You may need to use several different tools to gather the intelligence you need, but there are plenty of options available and are not limited to the ones listed here. Be sure to explore your options and find the data that makes the most sense for your needs. SEMRush is a versatile competitive analysis tool that doesn't't’t require a large budget. It is great for monitoring competitors’ display advertising and search engine marketing strategies. Ahrefs is one of the most popular research tools on the market. If you want to get the most detailed reports, plans are available at an additional cost, while the free version provides about 5 data points each. Still even the free version can provide pretty good insights. WhatRunsWhere generates real-time data on the display networks, creatives, and keywords that your competitors are using. The data goes back several years, allowing you to see how your competitors’ advertising campaigns have evolved over time. However, WhatRunsWhere does not supply any information on organic search rankings or other free traffic sources. The standard service also doesn't't’t deliver any information on a brand’s social advertising strategies, so it’s best used in conjunction with other competitive SEO analysis tools. What common themes have you encountered? Does the data lead to a new opportunity? Does the information change your point of view? What opportunities could you test? What new energy and details can you apply to your redesign and branding to be better? 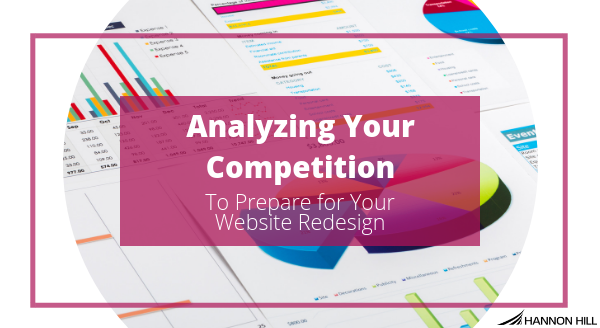 This process should prepare you for solid branding and stronger competitive positioning for your website redesign project.